When you are in a hurry, sometimes you just don’t have time to make multiple turns to get yourself headed in the right direction. That’s where U-turns come in. They allow you to easily turn yourself around and get on your way. However, before you make a U-turn, it is important to make sure you are doing it legally. Unfortunately, the answer to what is legal is not one-size-fits all. 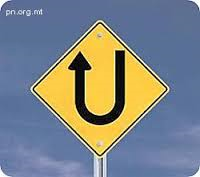 Each state has different laws regarding U-turns. But since Texas is our home turf, Texas laws are what we will talk about. You can only make a U-turn if you can clearly see at least 500 feet both in front of and behind you. This rule is pretty obvious. If you can’t safely make the turn, don’t make it. If a police officer sees you make a turn that he deems unsafe, you may very well get a ticket for reckless driving. You cannot make a U-turn if a No U-turn sign is posted. While most intersections are okay, if the city thinks a particular intersection is too risky to make a safe U-turn, a sign will be posted. If you see the black U-shaped arrow covered with a big red circle with a line through it, do not make a turn. This is not just to prevent yourself from getting a ticket: It is for your safety. You have to follow basic rules regarding left-hand turns. This means that at a signaled intersection, you have to wait for the green light to make your U-turn, and then yield to oncoming traffic if necessary. This may seem obvious, but should still be said. You have the right-of-way. If there is someone trying to turn right at a red light onto the same road you are making the U-turn onto, you do have the legal right to go first. That being said, you always want to make sure the car sees you. In summary, making a U-turn is all about ensuring your safety is a priority. If you can make sure that you drive defensively, check for oncoming traffic, and pay attention to any posted signs, you should be on your way in no time at all.